The fact that it has an engine in the rear and a rear wing this large should give you an idea of the power it puts down. 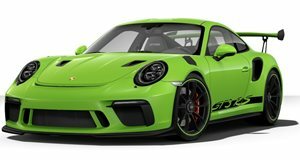 It’s a bit interesting how most of the car community gets down on their knees and worships the Porsche 911 GT3 RS as if it were some rear engine deity that no other automaker can touch, but many forget that there’s another car within Porsche’s own ranks that can strip the GT3 RS of its medals. And no, we’re not talking about the 918 Spyder. In fact, the GT2 RS is within the 911 family, and thanks to a turbocharged flat-six, is a fearsome beast to behold. It’s not clear how much power Porsche is planning on installing into the upcoming 911 GT2, but by the looks of this clip depicting a preproduction test mule pillaging the Nurburgring, it’s quite a bit. The 997 GT2 RS carried with it a 620 horsepower production plant over its rear axle, so we can expect this version to somewhere north of that. Porsche’s recipe for the GT2 RS was a bit shocking when the automaker announced it in 2010. Essentially, it was to take the GT3 RS’ chassis, add 90 horsepower by giving it an old GT1 engine, shaving 90 pounds of weight, and recruiting any masochistic drivers who wanted an attempt at lap time fame. Those that did seemed to have the ride of their lives, and it's no different this time around because flashing brake lights and the metallic roar of a Porsche flat-six are the makings of an epic day at the Nurburgring.